When the name Michael Bay comes up in conversation, it is usually met with ridicule. I can understand why. Bay's films are always completely outrageous in logic, ridiculous in scale, epic for the sake of being epic, and either adversely or intently offensive. If a comedy show ever decides to parody Michael Bay, its fairly easy to do, just blow a bunch of stuff up and bullets whizzing by at ludicrous speeds and you have yourself a Michael Bay parody. Sometimes, I think Bay deserves the harshest of sentiments that get hurled his way, but other times, I think we overlook his talents. 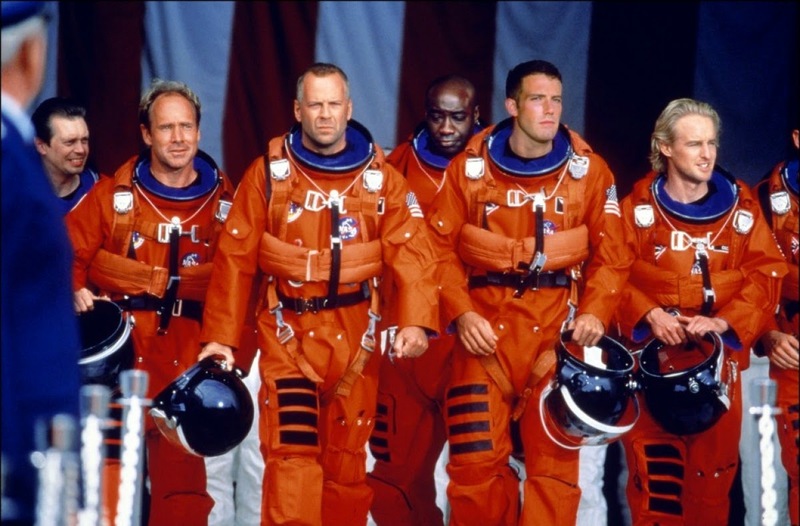 Many people have heard of the movie "Armageddon," they have either seen the movie themselves or they know the movie because it delivered the song "I Don't Want To Miss A Thing" by Aerosmith. Its a pretty easy movie to remember. A cast full of A-list stars save the world from a meteor heading towards Earth, which is the size of Texas. In this moment of despair, NASA would find an oil rig crew, train them for twelve days, then shoot them into space in an attempt to drill a hole into the massive asteroid, drop a nuke and high-tail it out of there. The film features a cast that includes Bruce Willis, Liv Tyler, Ben Affleck, Billy Bob Thorton, Steve Buscemi, Owen Wilson, Michael Clarke Duncan, Jason Isaacs, Will Patton, Keith David, and Peter Stormare. A gigantic yet preposterously perfect cast for this type of premise. "Armageddon" suffers the same problems that most Michael Bay movies suffer from. The movie specializes in the most ridiculous of action and the most ridiculous of circumstances. Most of the movie could have been edited out in the editing room and still the film would have bared the same outcome. The audience is forced to take extreme leaps in logic. Something bad happens to the characters literally every five minutes simply so Bay can unleash special effects and unabashed extravaganza. Make no mistake, "Armageddon," is a Michael Bay movie, through and through. Bay is not a filmmaker who plays things coy. He doesn't shrink from a challenge. The term half-measure is something that does not exist in his dictionary. Yet, every time I watch "Armageddon," I can't look away. I am sucked in all over again. "Armageddon" maybe crazy, but it is just as confident. The movie is a summer blockbuster, and it wears it like a boy scout wears badges. It is a movie that features comedy, action, romance, thrilling adventure and treats all of those genres with respect. It is extremely well acted by its ensemble, and all the actors really embrace all the emotions they must display, no matter how phony or goofy they may turn out, each actor takes this enterprise seriously. I am taken aback by the epic awesome of this spectacle and never once does it feel fake or unreal. This is a Michael Bay movie that doesn't completely shatter the test tubes, an experiment that actually worked most of the time. I am always astounded by the confidence on display in this movie. It maybe easy to poke at Michael Bay. I will even admit that I have before, but when he gets it right he gets it right. Sometimes, I don't care if I am the only one in his corner. "Armageddon" is a guilty pleasure I'll have the rest of my life.